Team building activity – Escape Room! 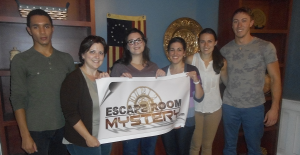 Grannas Environmental Chemistry Research Group > Uncategorized > Team building activity – Escape Room! As a research group team building exercise, we completed the “Revolutionary Spies” escape room challenge at the King of Prussia Escape Room Mystery. Made it out in 40 minutes! Not too shabby team! Research team building – Escape Room!